Did you know that on Cinco de Mayo American's consume over 70 million pounds of avocados according the the California Avocado Commission! That explains why I had to go to three grocery stores yesterday to find a ripe avocado--they were sold out! Lesson of the day--purchase your avocado's several days in advance. And since I only purchased one avocado I decided to make an avocado emulsion instead of guacamole. It's just as delicious, but turns one avocado into two! Place in a food processor or blender and blend until smooth. Chill until ready to use. Note: To save time, you can purchase canned Enchilada sauce, but making it yourself is easy and tastes so much better. Remove stems and seeds from chilies and toast lightly in a dry saute pan to bring out the smokey flavor. Bring water to a boil. Place all ingredients in a blender and pour boiling water over. Cover with lid and let sit for 20 minutes until chilies soften. Blend until smooth and strain through a mesh strainer into a bowl. Keep warm and set aside. Pre-heat broiler to 450 degrees and roast pasilla peppers until lightly charred on all sides. Place in a bowl, cover and let sit for five minutes to steam. Remove skin, seeds and dice peppers. Cover potatoes with water and bring to a boil and cook for 15-20 minutes until soft. Drain water, place in a bowl and mash with a hand masher. Add sour cream, butter, cheddar, peppers, soy or almond milk and season with salt and pepper to taste. You want the potato mixture to be firmer than normal mashed potatoes so that it doesn't ooze out of the tortilla when baking. Cover the bottom of your casserole dish lightly with enchilada sauce. Brush tortillas on both sides lightly with canola oil. I work with four tortillas at a time. Stack tortillas on top of each other and wrap in a damp paper towel and place in the microwave for about 10-15 seconds to soften. Dip each tortilla in enchilada sauce and fill with 1-2 tbsp potato mixture. Roll up and place in casserole dish, repeat for all tortillas. Or you can heat the oil, place in a bowl and dip tortillas in oil (without using the microwave) and then dip in enchilada sauce. Cover enchiladas with remaining sauce, cover with foil or a lid and cook in a 350 degree oven for 20-25 minutes until heated through. During the last few minutes of cooking, sprinkle the remaining cheddar cheese on top. 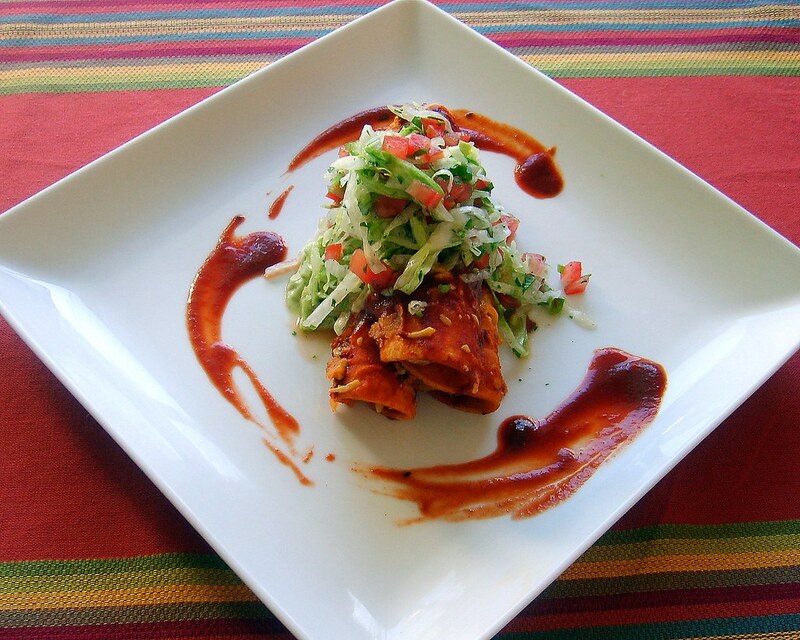 Serve enchiladas with a big dollop of avocado emulsion and a salad of shredded lettuce, diced tomatoes, finely minced jalapeno, cilantro and lime juice.